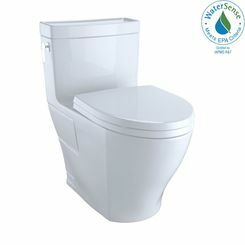 One-piece toilets, also known as single-piece toilets, consist of a bowl, tank, and other parts fused together as one whole unit without any joints. They give a modern look and feel to your bathroom. 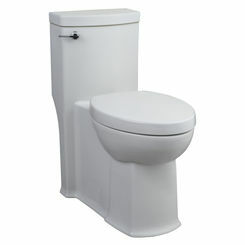 PlumbersStock has a gigantic selection of discount toilets from which to choose. 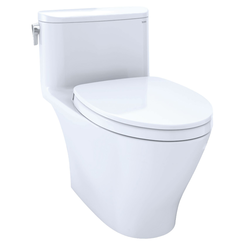 Read on for information about how to select the best one-piece toilet, or shop around and compare features and prices on all the best brands. 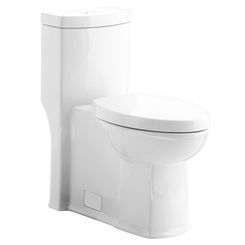 One convenient thing about one-piece units is you don't have to haggle with buying the toilet tank and the toilet bowls separately. No matter what configuration you choose, we carry the best brands, including TOTO, American Standard, Sloan, and the list goes on. 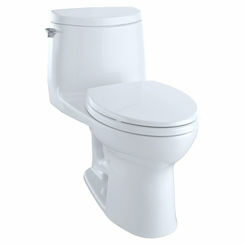 Smaller size - consumers typically choose to buy a one-piece round toilet when they face space constraints in smaller bathrooms. We also recommend these units for children’s bathrooms. Ease of cleaning - The design has been praised for how much longer the units can go without intensive cleaning. 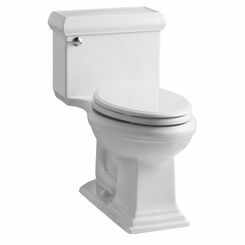 It does not have as many creases as the two-piece toilet, and there is no significant gap between the toilet bowl and toilet tank. It does not collect dirt, dust, and grime in as many places. 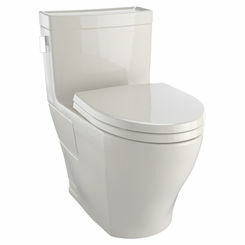 The one-piece toilet design makes the product much simpler to wipe clean and maintain. 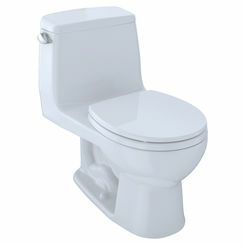 Durability - constructed from a single piece of porcelain they are made for durability. 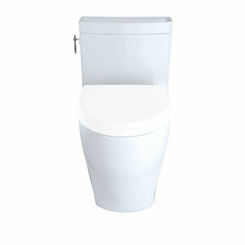 The inner workings of a one-piece toilet, such as the pipe elements and tanks, aren’t exposed to moisture and therefore can last longer. Price – depending on how you look at it, typically a one-piece unit is more affordable than the alternative. If you don’t plan on staying in your place a long time, a one-piece is a cheaper investment and requires less maintenance. However, if the tank cracks, you have to replace the whole thing, which makes it more expensive in the long run. Ease of Installation - The inner workings of a one-piece unit will be the same as a two piece. They function identically. Installing a one-piece is a much less complicated task. 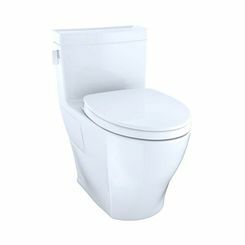 It typically comes with all of the necessary pieces included, and you don’t have to worry about installing the bowl and tank separately. Remember to get wax rings and bolts for the install. You may need to consider your bathroom space, or you may need a hand with the installation as it is bulky and heavyweight. It may be hard to move but doesn't need to be assembled! Toilets come in different colors to match the style of your bathroom so you can achieve the look and feel you've always wanted. 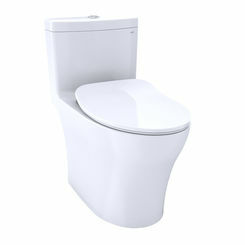 White - toilets usually come in a standard white finish, which some seem to think makes smaller rooms appear larger. It creates an open, airy feeling. Different shades include cotton white, colonial white, Sedona beige, biscuit/linen, bone, almond, and more. Ebony - this is a dark, black finish that gives a bold and mysterious touch to your bathroom. Other than looks, you will also need to think about the shape and size of your bathroom. Will it fit just right into your space? For a perfect fit, measure the rough-in size. The standard rough-in size is 12 inches. There are also 10 or 14 inches. 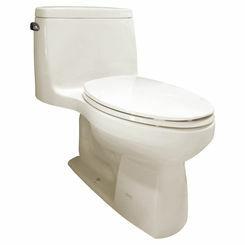 The toilet comes in two shapes: round and elongated (oval). 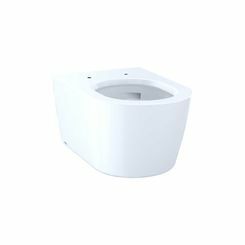 Round bowls have a more compact design and are perfect to fit smaller bathrooms and powder rooms while elongated bowls extend out further with extra space for added comfort. You might find yourself asking, How much water does it use? And How thoroughly does it flush? There is ingenious technology now that provides you with the flushing volume you need while conserving water. Most of the one-piece toilets we offer are water-saving toilets, which use between 0.6 and 1.6 gallons per flush. Since the one-piece system is the newer technology, most of them are up to date with ADA guidelines (Americans with Disabilities Act). 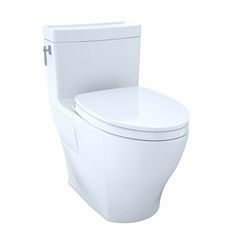 We offer these life-changing toilets that have raised toilet seat, tool-free removable arms, added height, and wider space - making life easier and more comfortable for you! TOTO leads the way when it comes to electronic bidet seats. 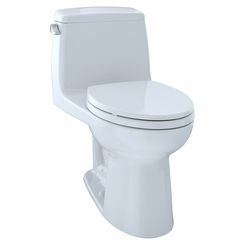 Take into consideration the GPF, or gallons per flush. Save money and the environment by being mindful of that feature. 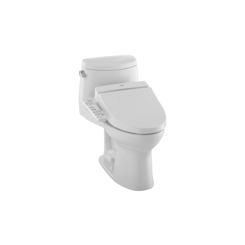 For the fashion-forward types, we offer sleek looking ebony toilets manufactured by TOTO that are sure to distinguish your bathroom, from a design perspective. 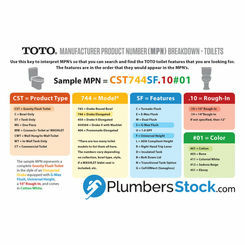 If you need toilet supply lines or are looking for toilet parts, PlumbersStock has a seemingly endless discount supply. We even have tank levers and fill valves!